Proper skinning is essential for rugs and mounts. 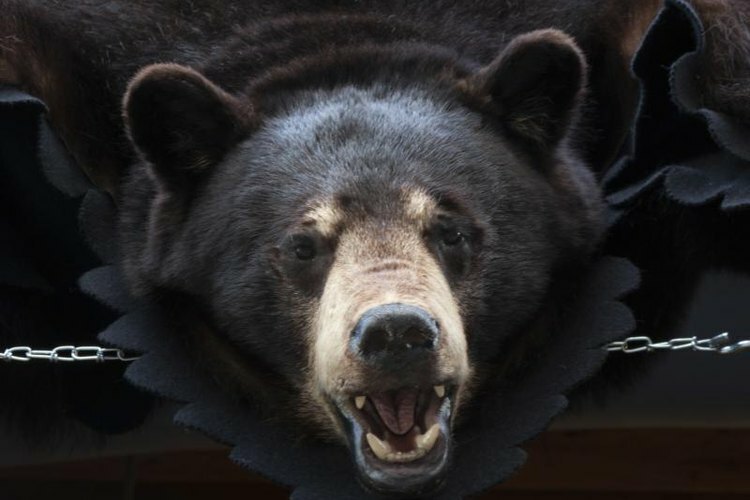 Skinning a black bear for mounts and rugs requires special attention to detail. Skinning in the field is difficult because the conditions are outside of your control. You may find yourself working in heat, cold, sleet and snow. Working with the paws and head are the most difficult aspects of skinning a bear. Make a shallow incision just above the pelvis with the skinning knife. Hold the knife blade in an upward direction to prevent cutting any organs or intestines. Run the knife from the pelvis to the throat. Make an incision from the chest, along the inside of the front legs until you reach the paws. Stop at the base of each front paw. Find the joint where the wrist-bone reaches the base of the paw. Cut through the joint with the serrated knife to separate the wrist from the body. Make an incision from the pelvis, along the inside of each hind leg with the skinning knife. Stop when you reach the base of each paw. Cut through the wrist joint located at the base of each paw to separate the paws from the carcass. Use the serrated knife for the joint. Work the knife between the hide and the flesh to separate the hide from the body. Work along the white tissue to avoid puncturing the intestines or the hide itself. Continue until the entire hide is free from the carcass. Cut the neck at the base of the skull with the serrated knife to separate and compete the skinning process. This leaves the skull intact for the taxidermist. Roll the hide and pack it in a game bag for transport from the field. Immediately rub the entire skin side of the hide with 20 pounds salt or place the hide in a freezer to prepare for the taxidermist. Sharpen the knife several times throughout the process. A sharp knife is critical to the skinning process. Use a rounded blade skinning knife for the actually skinning and use a saw or serrated knife to cut through hard joints and bone. This will help keep the skinning knife sharp.